Neon signs are the classic Las Vegas art form and The Neon Museum's mission is to collect, preserve, study and exhibit neon signs and associated artifacts to inspire educational and cultural enrichment for diverse members of our international community. Parents and children will be amazed at this wonderfully nostalgic trip through Las Vegas? past. The Neon Museum was established in 1996 as a non-profit organization and its collection of retired neon signs dating from the 1930s to present day. Each piece has its own story of how it inspired Las Vegas history and who created it. 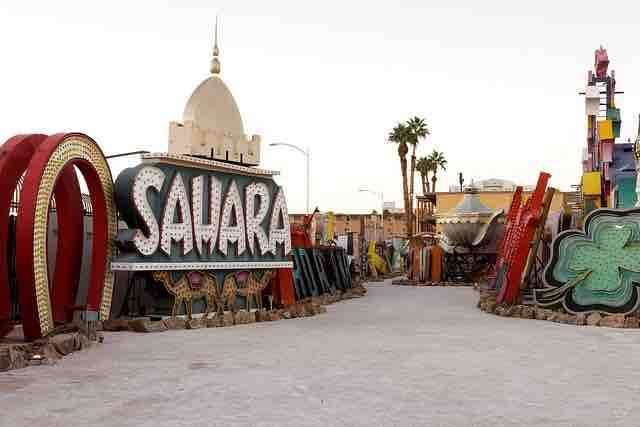 In 2012 the Neon Museum Boneyard opened at 770 Las Vegas Boulevard North. The nearly two-acre campus includes an outdoor exhibition space, known as the Boneyard, which features more than 150 signs, six of which are restored, a visitors' center housed inside the former La Concha Motel lobby and the Neon Boneyard North Gallery which houses additional rescued signs and is used for weddings, special events, photo shoots and educational programs. Hour long docent-guided tours of the Neon Boneyard are available seven days a week. The Museum includes nine restored signs which can be viewed as public art and visited on a self-guided tour twenty-four hours a day, seven days a week. The gallery includes the Lucky Cuss Motel, the Bow & Arrow Motel, The Silver Slipper, Society Cleaners, Binion's Horseshoe, the Normandie Motel, the Hacienda horse and rider, the Landmark and 5th Street Liquors. Due to the broken glass, rusty metal and darkness, we recommend night tours for children ages 12 and up. Other family attractions close by the Neon Museum are the Las Vegas Natural History Museum, the Discovery Children's Museum and the Old Las Vegas Morman Fort State Historic Park. When your tour has ended, enjoy the free, live entertainment at the Fremont Street Experience with its 90' canopy of 12 million lights and 555,000 watt sound system. Just around the corner, on Main Street, in front of the Main Street Hotel and Casino, several vintage Pullman Dining Train cars are on display at street level. Families will find the walk past the train cars an interesting bit of nostalgia when reading the descriptive plaques and viewing the contents of the cars, right down to period correct dinner plates.